This project does the same work as this project https://www.hackster.io/44558/amazon-echo-control-iot-devices-via-http-154590. But there is only one difference, the one project uses MQTT and the other uses HTTP. This article is not difficult but quite long. I try describing clearly step by step. 2. Functionalities of each part and interaction among the system parts. 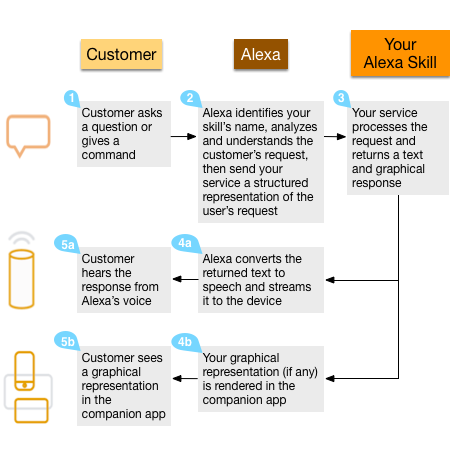 In comparison with Custom Skills, Smart Home Skills is simpler to implement but less flexible. Therefore, in my design, I will build a “Custom Skill” based on system architecture of “Smart Home Skills”. - Amazon echo: (1) Getting your voice command, stream it to Alexa service. (5a) Receiving response from Alexa Service. - Your service: (3) this is where you write your code to handle command from Alexa. Your code will perform two main tasks: send necessary data to Device Cloud and send the response to Alexa service. You need to know endpoint of Device Cloud and put it in source code. - IoT device: (5b) Getting command and take action according to the command. - Amazon Echo: you can use Amazon Echo, Amazon Tap, Echo Dot or Echo Look. I am going to show a very simple example of voice-controlling on/off a light bulb. Another example which is quite complicated will be present in the next article. - Amazon Echo: Amazon Echo Dot. - The service: AWS Lambda. As I described before, the system includes five parts. The following is five steps to do on five parts, respectively. - Click “Add a New Skill” button, fill some information as below, click “save” and then “next” button. You can change vocation name to “robot” and can say: Alexa, tell robot turn on/off the light. For "LightState" and "ControlLightBulb", you can search them on index.js to see their meaning. Publish a message to MQTT cloud. - Go to https://aws.amazon.com/ , Click “Sign in to The Console” button at the top-left. - You will see a template function “alexa-skills-kit-color-expert”, click download icon to get the sample code. We will modify and compare this code later. Then, close download window and click “Blank Function”. (Amazon may change the template code overtime). Role: Firstly, select “Create a custom role”, it will redirect to create a custom role. (refer to Appendix 1 to create a role). Secondly select “choose an existing role”. Existing role: choose the custom role you have just created. - Click “Create Function” it will redirect to function management page. You will upload code at this page. Please pay attention to the upper right corner of the ARN string, this is the endpoint of this Lambda function which we will put it in Alexa Skill configuration in step 2.
we already downloaded ““alexa-skills-kit-color-expert”” sample code. Unzip this code and see the index.js file. I modified it to control the light bulb (see index.js in the code section). You can compare my index.js code and index.js code from template to see the difference (I recommend to use the WinMerge tool for compare two file http://winmerge.org/ ). When you compare two file, it’s easier to understand the source code and how it works. - Since this function publish message on MQTT cloud, we need to install mqtt library for Node.js. Refer to Appendix 2. Suppose that mqtt library is installed in “D:\lambda_function” directory. - Copy the index.js file to “D:\lambda_function”. Zip it to anyname.zip (do not zip the folder, just zip all inside “D:\lambda_function”). See my .zip file in attachment part. In some MQTT cloud, we may need to register an account or do some the setting. However, in iot.eclipse.org, we don’t need to do anything, just publish/subscribe any topics on it. In this code, we just need to subscribe the topic on MQTT broker to receive message from Lambda function. When receiving the message, this code turn on or off the light bulb according to value in MQTT message. Install mqtt library to “D:\lambda_function”. const speechOutput = "Welcome to P H P o C. How can I help you?" * Control Light Bulb in the session and prepares the speech to reply to the user.